“I am trusting you to catch me when I fall. 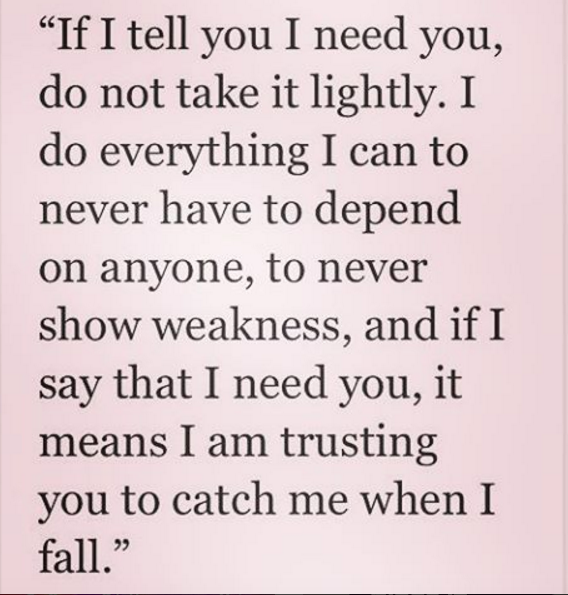 When I tell you I need you, do not take it lightly…” I love this because I think this idea is true for so many of us. While we may have a lot of friends, colleagues, or even close relatives, we do not give our trust away lightly. If we’re lucky we have a handful of people that we believe we can trust. That we depend on, that we share our secrets with, and that when the s*** hits the fan, they do not hesitate to come to our aid. These are the relationships we value most and the ones we need to protect. But I’d like to challenge one part of this quote- “I do everything I can never to have to depend on anyone, to show weakness.” I want to challenge the idea that depending on someone is weakness. Says who? At a couples training conference I attended this past summer, Dr. Sue Johnson said we must allow ourselves to be “constructively dependent on our partners.” And I completely agree! We live in a society that shames being co-dependent and while I agree we need to be able to stand on our own two feet, where does being independent and believing were weak for asking for help leave us? In excess, it leaves us alone. And as human beings we are programmed to connect; we are meant to rely on others. Evolutionarily living in communities was how we survived. So next time you think about vulnerability as weakness, try reframing that belief and ask yourself how can I be constructively dependent on my partner? Might being vulnerable bond us closer together rather than pushing us apart? How do I ask for my needs to be met without believing I’m weak for doing so? Bc in fact trusting someone else with our most vulnerable parts is one of the strongest things we can do.